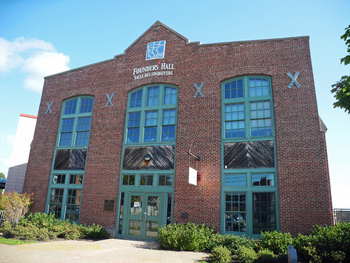 Founders Hall near where the cruise ship's dock has been transformed from a railroad building into an interpretive center that tells the story of the founding of Canada. 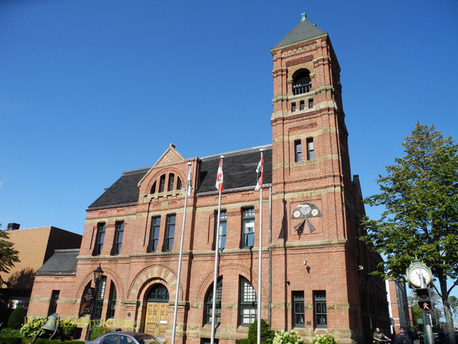 Charlottetown is the capital and principal city of the Canadian province of Prince Edward Island (frequently referred to as “PEI”). It has a population of about 60,000 people. 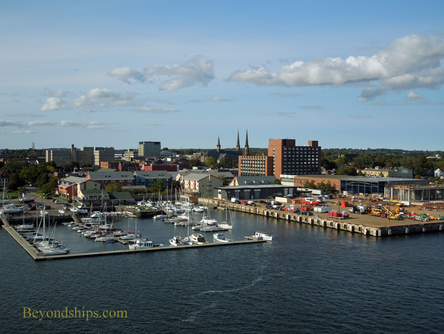 Although Charlottetown is a capital city, its downtown area has the ambiance of a town rather than an urban center. It has wide tree-lined avenues interspersed with green parks. Well-maintained Victorian buildings intermix with stylish old houses. You can leisurely walk the entire area in a few hours. For an even more relaxing tour, you explore it from one of the horse-drawn carriages that roll gently though the center of town. Province House is the central landmark. It was here in 1864 that delegates from what were then Great Britain's Canadian colonies met to discuss forming a new country. These talks eventually led to the confederation that would become Canada. 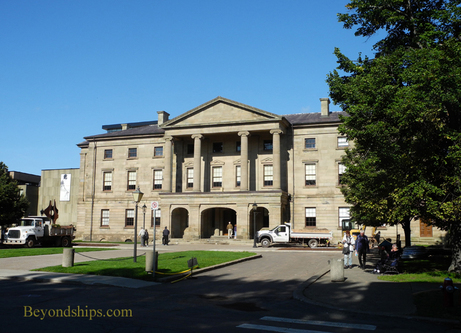 Today, the building is the seat of PEI's government. You might well get the impression from the unhurried downtown area that PEI is a land that time forgot. However, if you venture further afield, you come to strip malls with the usual nationally and internationally known chains of shops and eateries. There are also large, modern university campuses. Thus, the Prince Edward Islanders do live in the 21st century. However, they have not let their center city decay but rather preserved it as a living part of their heritage. Going beyond Charlottetown, the countryside is dominated by farmland that covers rolling hills. There are some 2,000 farms on PEI. However, one of these takes precedence - - the farm that was the setting for the fictional Anne of Green Gables stories (see separate article and slideshow). An entire industry has grown up on PEI around Anne. Fishing is another important industry and in the seaside hamlets you can see fishing boats and lobster pots. It is quite scenic as is the shoreline in Prince Edward Island National Park with its beaches, sand dunes and red sandstone cliffs (see video). 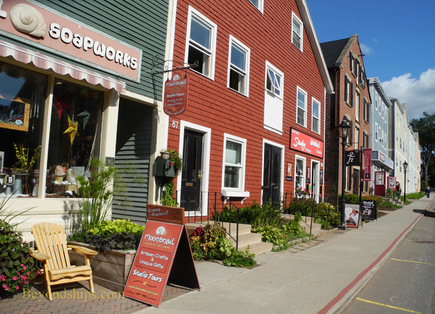 Above: The streets of Charlottetown combine historic houses and interesting shops. 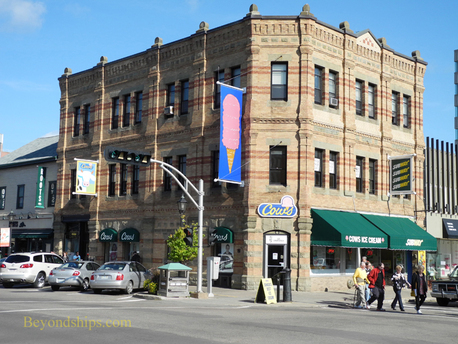 Below: Cow's ice cream palace in downtown Charlottetown is a family favorite. 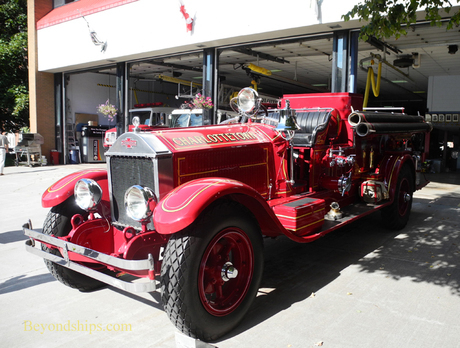 Below: An antique fire engine. 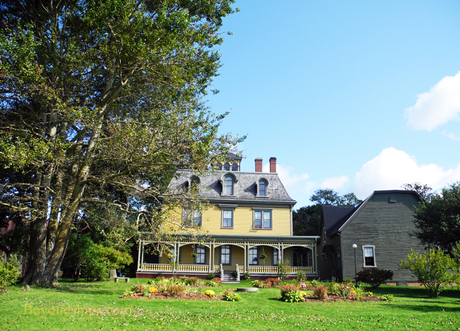 Above: Beaconsfield Historic House is a Victorian mansion that dates from 1887. It was the home of a shipbuilder and has been nicely preserved. Below: St. Dunstan's Bascilica, built in the Gothic-revival style between 1896 and 1907, is a Roman Catholic cathedral. 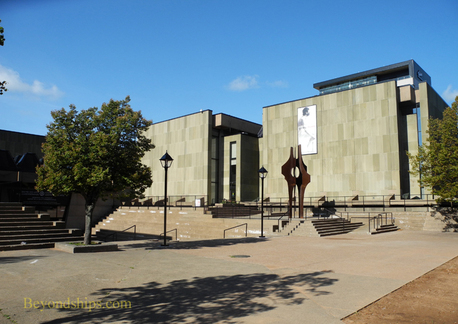 The Confederation Center of the Arts includes four theaters and an art museum. It was dedicated by Her Majesty Queen Elizabeth II to mark the 100th anniversary of the Charlottetown Conference and is the national memorial to the Fathers of the Confederation. The French explorer Jacques Cartier was looking for a route to China when he came across Prince Edward Island in 1534.French settlers followed to Ile Saint-Jean. Their small settlement called Port La Joye was near present day Charlottetown. During the 18th century, the British and the French were often at war and their fighting carried over to North America. In 1758, during the French and Indian War, the Royal Navy arrived in the fine natural harbor near Port La Joye and quickly evicted the French. To defend their new possession, the British built Fort Amherst. At the end of the French and Indian War in 1763, the French ceded their Canadian possessions including Ile Saint-Jean to Britain. 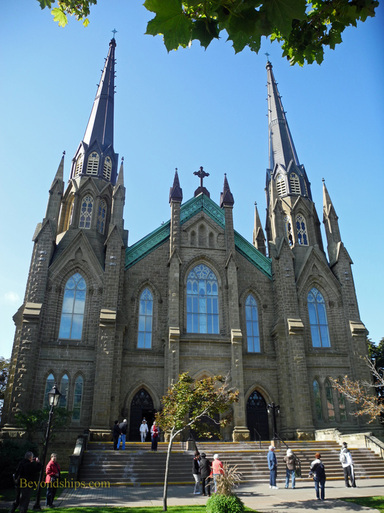 The name of the island was accordingly anglicized to Saint John Island. Not long thereafter, work began on a new harbor settlement, which was named after Queen Charlotte, who was the wife of the reigning monarch King George III. Thus, Charlottetown was born. The island's population again looked to the family of King George III for a name in the late 1700s. They successfully petitioned the sovereign for permission to change the name of the island to Prince Edward Island after the king's son Prince Edward Augustus. By the middle of the 19th century, Canadians were thinking of forming their own country. Accordingly, in 1864 representatives from PEI, Nova Scotia, New Brunswick and the then-combined colony of Ontario and Quebec met in Charlottetown to discuss forming a confederation that would be a dominion under the British crown. The talks eventually led to the formation of Canada on July 1, 1867. (Ironically, the province that got the ball rolling by hosting the Charlottetown Conference, did not join the confederation until 1873). The next major event in PEI's history came in 1908 when islander Lucy Maud Montgomery published her novel about an orphan girl growing up on the island. Anne of Green Gables drew world-wide attention to PEI. Because PEI is an island, it was somewhat isolated from the rest of Canada, especially in the winter months. However, in1997, the Confederation Bridge was completed. It is the longest (eight miles) bridge over ice covered water and links PEI to the rest of the country via New Brunswick. As a result, a substantial tourist industry has developed with vacationers crossing the bridge to enjoy PEI's beaches and other attractions.